I arrived in Key West on September 18, 2006. In these last seven months I have become accustomed to living on a tropical island. In some ways, Key West reminds me of the island of Maui. Similar weather and wildlife, but not as many volcanoes. The local wildlife is primarily chickens, which are protected. We have settled into somewhat of a routine, spending the majority of our time together on weekends. The marina in downtown Key West is our favorite place to walk, and we often start the journey with a meal or drinks at Dante's or Pepe's, make a stop at Kermit's Key Lime Pie Shoppe, and end up by A&B Lobster House or even Island Dogs on Front street. We make it to church up the Keys about 3 times a month and like to hit the beach at Bahia Honda in the afternoon. The best Thai restaurant is on Key Largo and the best Grilled Cheese sandwich is at Bobalu's Southern Cafe. We have been honored to have guests in the last few months, the first being my cousin Giselle, followed by Kirk and Denny the following week and Scott's parents a few weeks ago. We really enjoy showing off our favorite spots in the Lower Keys and finally purchased dining room chairs so we were able to make dinner a few times with Gary and Carla. I have made the trip to the west coast twice; once with Scott in December for Christmas and then again alone in early March to sing back-up for Megan's CD release concert and finish recording my first song. We made some friendships initially that have kind of fizzled out over the last few months, but friendships we felt were pretty shallow to begin with have proven themselves much stronger. I have changed jobs and am now really enjoying my time at work daily and having a wonderful time working with the wide variety of creatures at the store. I am excited to be learning about many different animals and their environments, and testing myself on my knowledge of freshwater and saltwater fish. Scott and I's relationship has only become stronger in the last seven months. 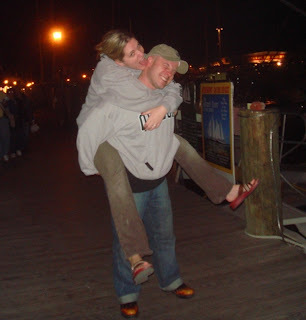 When we moved here to Florida, we had only ever spent about 14 days together and that was spread out over 5 months. Our drive from Washington to Florida was the longest consecutive time we had spent together up until that point and was a real test of our friendship as well as our relationship (and our tolerance of felines). Since our engagement in December we have been steadily growing together and enjoying our family of animals. And most importantly, the cats don't hide on top of the refrigerator from the dog anymore. Working at the pet store has given me the opportunity to learn about a lot of animals I knew nothing about. This is Bam-Bam... a Blue and Gold Macaw, of the parrot family. To his left is an African Grey Timneh, also a parrot. They are both about 14 weeks old and came to the store at a few weeks old when they still looked like a cross between a porcupine and a plucked chicken. Another of the baby birds was a Green-Cheeked Conure. I called him Squik and tried not to get too attached, but he was a character and easy to love. He went to a wonderful home last week and I miss him dancing around in front of the door of his cage lecturing me to let him out to play. I don't miss him climbing up onto my head and pooping on my back. The next day my other favorite animal - a white chinchilla - went to a great home. I am very happy for him, especially considering that he used to escape out of his cage every night at the store and would run rampant until we could extricate him from under the shelves of pine bedding. 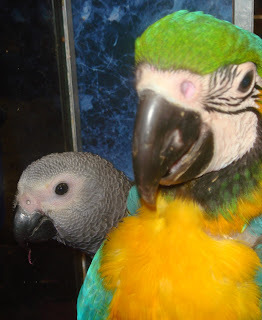 This week we welcomed more baby birds, a few Conures, two more African Greys and an Umbrella Cockatoo.